Size of the compressor: 7.75" x 5.5" x 6.5"
Many artists prefer Paasche Airbrush products as they suit a wide range of applications. Various airbrushes, airbrush compressors, and spray booths are perfect for painting, tattooing, tanning and more activities. Like this Paasche D500 airbrush compressor, that suits perfectly for any hobbies. Our shop also offers a wide assortment of Paasche products including springs, cups, needles, and other necessary supplements. 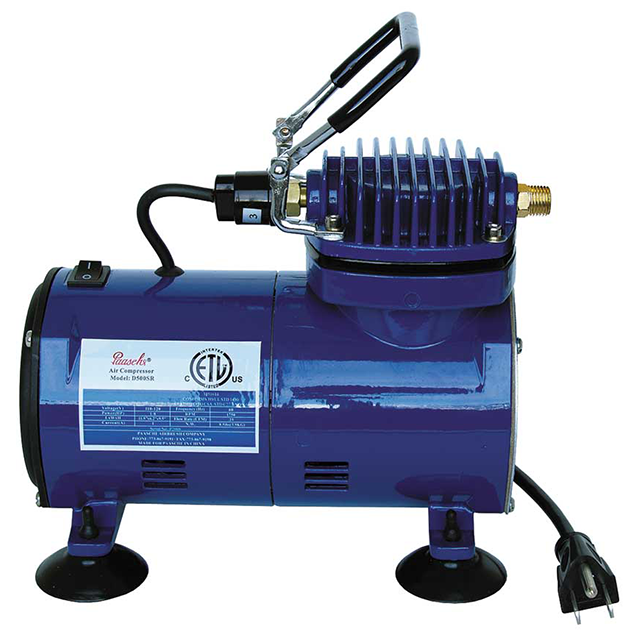 The Paasche D500 is a sturdy, reliable, and versatile air compressor. With it, you'll be able to smoothly spray paint thanks to the 1/5 HP motor that adjusts the pressure gradually. However, the pressure doesn’t increase endlessly; its maximum peak is 35 PSI. 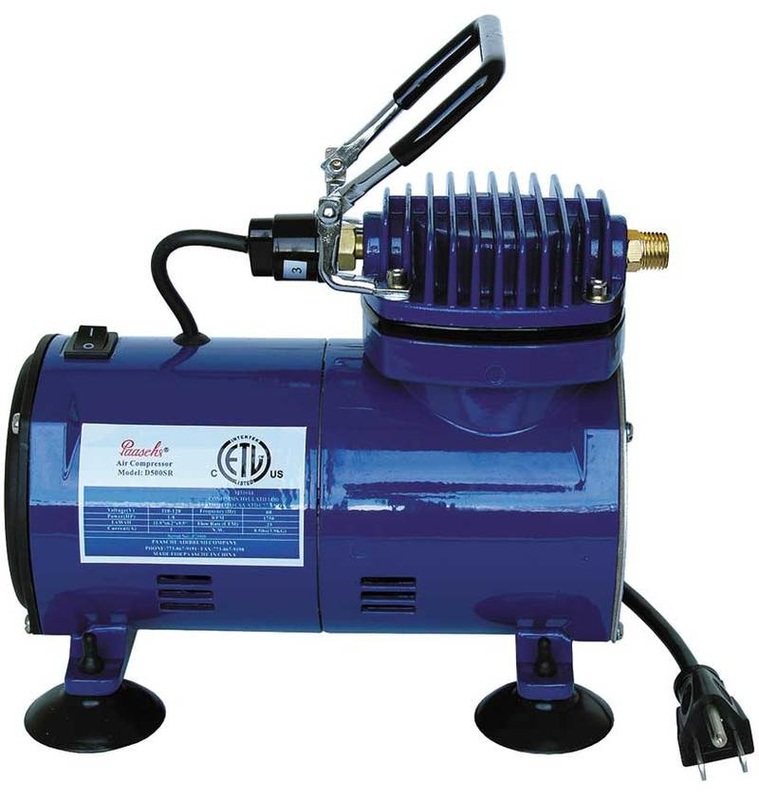 In order for the pressure not to reach beyond the limit, the compressor includes the regulator. This detail helps to control inlet, outlet or differential pressure, and gas flow so that it could secure an efficient operation and a running order of the mechanism. It’s useful to know that sometimes condensate can form inside the compressor and that can interfere with the proper operations of the device. For that reason, there is the moisture trap that absorbs excess humidity. 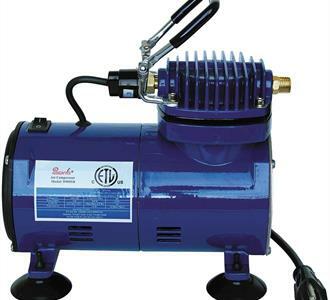 Thus, all the parts of the compressor serve to lengthen the durability of the item for a long time. Another important feature is the compact size of the Paasche D500, due to which it doesn’t take up much space so you can place it on any table. Moreover, you can carry the device anywhere with the help of a handle on the top. The non-slip rubber coat grants a firm grip. 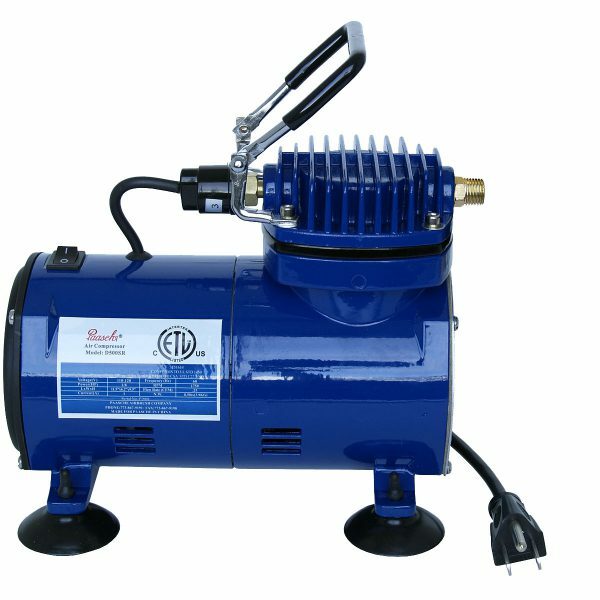 More than that, the compressor is quiet providing only 47 Decibels. Therefore, you won’t be disturbed by the compressor running and will be able to focus on your artwork. Beyond that, the item has an auto-shutoff feature that turns the device off while you aren’t using the airbrush. The compressor will start again when you allow air to go through the airbrush. Also, take into account that you need hot water to clean the compressor. HFM manifolds that are suitable for multiple hose hookups. Each hose attachment has an open-close valve. Hose adapter. If you have 1/8" NPT hose fitting, choose the HF-592 adapter. Get HF-116 adaptor for 1/4” hose fitting. A-194 airbrush holder that can hold up to 4 airbrushes together. AC-7 kit that contains seven brushes for cleaning.